Cancellation policy: At least 7 days advance notice for free cancellation. 1. Check in from 15:00 to 22:00. Arrival after hour please make advance notice with flight number for hostel to arrange staff waiting. 5. No Smoking. Smoking area is provided in the first floor garden. ***We have an Asian-preference mattress which maybe a bit hard for some Western guests. Each equipped with fordable desk, power sockets and personal reading light. Shared bathrooms with 24hr-hot shower. A/C in every dorm and free WiFi throughout the entire building. We have bike/motorbike parking spots available. Everyone at Baan Heart Thai is absolutely amazing. The facility is spotless. It’s reasonably priced and I love the pod idea with a double bed, makes you feel like you almost have your own private room. I originally booked for 4 nights and I extended 3 more nights. I highly recommend. It is also so convenient to everything in the old city. Loved the hostel, met some increadible people there! Total chill vibe (not the place if you want to party), awesome staff and clean facilities. They also have bikes to borrow for free and organized a visit to the Sunday market and to a drag queen show which was super fun! Has everything a hostel needs. Place to interact with others, quiet library for reading, place to just chill at the top floor. 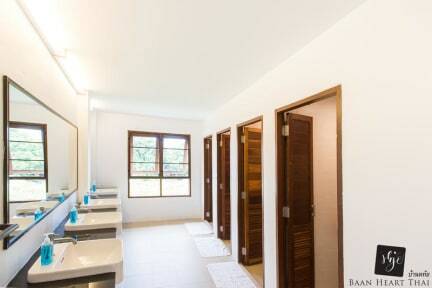 Extremely clean facilities. Casey is amazing. She knows what everyone is doing in the day and always welcome us back with a smile, asking how was our day. A lot of effort put in to ensure we get a variety of breakfast every morning and she even brought us out personally for pad thai and fish spa during my stay there. Overall, an amazing stay and experience. 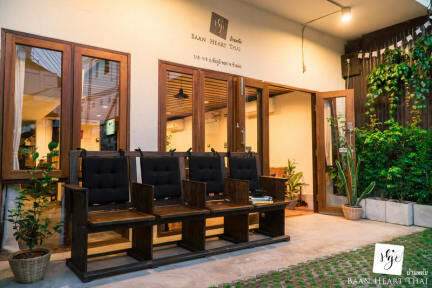 I had a wonderful stay at Baan Heart! The hostel is beautiful and impeccably clean. I felt very welcomed by the staff and the other guests were super friendly as well. My bed was a little haven in Chiang Mai - very comfortable with all the amenities I didn’t even know I needed (even a little pull out desk!). The breakfast was delicious and varied each day! Thanks for being a wonderful home for the last week. I was looking for a quiet place to rest for a couple of nights before I began my Yoga teacher training and this was the perfect choice. The staff was so friendly, the library was awesome, the beds were comfy, everything was clean and my favorite part was the delicious breakfast they provided! Highly recommend. A incredible hostel experience - they have the best staff and extremely nice accommodations. I hope to come back soon!! Everything about Baan Heart is a 10. It's more like a hotel than a hostel. Sparkling clean, amazing varied breakfast every morning, filtered water for drinking and filling water bottles, towels + linens + shampoo + body wash provided. I felt like I found a family there, and Annie, the owner, is perhaps the kindest person ever. A few of us had to find other places to stay because BH was full, and we kept coming back just to hang out because we loved it so much!! Very safe, perfect location. I only stayed here a night but great location, massive lockers both inbuilt into your bed and in the room, towels and water refills included. Relatively quiet in the evening but the staff make effort to give you recommendations and the night after I checked out they held a bbq so I’m sure I would have seen a different side to the hostel. Such a cute, clean and modern hostel! Breakfast was lovely and staff were super helpful. Plenty of secure storage and beds were private and comfortable. Not super social but in a good area of town easy to sight see from. The provided shower gel was also super soft and made my skin feel amazing.